Everyone's seen this guy's dresses, right? I mean, they're in each fashmag each month, on radically different people (okay, radically different in the fashmag world, which means models AND actresses AND socialites AND random people employed in the fashion industry). So you've probably seen them. What I don't know is if your eye is caught by them the way mine is. Obviously the large, clashing patterns push my buttons, along with the higher waistline and fullish, knee-length skirt. In fact, you already that I really like this style, because I posted about a very similar vintage one a few months ago. If I made myself one, I would (of course) do it in two clashing Liberty Varuna wools, and wear it all winter long. Peacock-feather wool for the body and a geometric print for the bands. I'd narrow the sleeves a bit (I hate to have my sleeves trailing in the butter), as well as narrowing the shoulders and armholes, and widen the waistband. And, of course, I'd add pockets. Click on the image if you want to know what the real thing costs, and where you can buy it. Very ’70s cut; I love it. And mmm, peacock-feather wool. It *would* look good on you!Somebody’s got to be knocking these off. Where are they? I know that Hotpatterns.com has a pattern like that. It’s called “The Hippy Chick Dress”. They do! And it’s sold out. 😦 But it comes in large sizes, too, so Herself, you could get one made! I had that identical dress back in high school — well, the identical cut, if not the amazing print.And yes, it was an Indian rayon special, and yes, I wore it till it fell to bits. 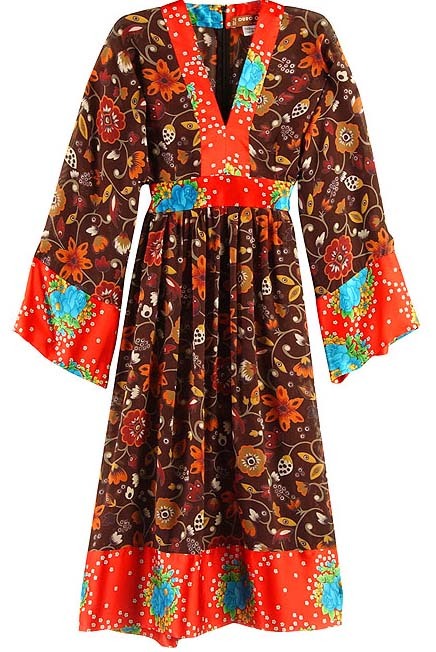 I just saw the Hippy Chick Dress in person, tonight, and it’s terrific! It had been made up in subdued fabric (deep brown and black velvets), but in cheerier, louder choices it would look much like this. I hear Hot Patterns is trying to get their shipping troubles straightened out (demand exceeded supply when they launched their company a couple of months ago) and they should be up to speed soon. Or so I and all my sewing-fanatic friends hope! >Somebody’s got to be knocking these off. Where are they?I know someone who inherited a few very similar dresses from her Czech mom from the 1970’s. Maybe we need to go to thrift stores in Prague. I’m not convinced that it would look flattering on me at all. Hello all! I just found a pattern that is VERY similar to this dress, and am having the pattern altered just slightly to replicate this dress. Would you believe it’s VERY EASY VOGUE 7820? The woman who’s sewing it for me told me it will only take about two days!! Yippee! !Good luck! I don’t think I saw it in the comments yet, apologies if I scanned past it, but did somebody already mention Simplicity 4072? Because it would make something just like that dress (but with a waist tie instead of fitted with a zipper). I have the pattern but haven’t made it yet…mostly because i am dithering between fabrics. Can’t wait to see if you make one!